Tomato Sauce - 1/2 tsp. 1. Keep all the ingredients ready to make vegetable rice. a. Finely chop the onion and slit the green chilies. b. Chop the carrots, beans and capsicum. 2. Heat oil in a kadai, add mustard seeds and cumin seeds. When the mustard seeds splutter, add the onion and green chili. Saute till the onion turns translucent. 3. Add all the vegetables except green peas and saute for 2 minutes. 4. Add chicken masala powder, turmeric powder and salt. Mix it well. 5. 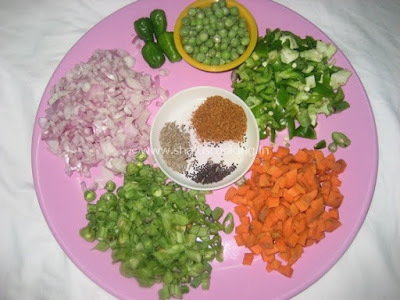 Add the green peas and mix well. Sprinkle some water and cook covered till the vegetables are cooked. 6. Add the cooked rice and mix well. 7. Add the Soya sauce and Tomato sauce and mix well. Switch off the flame and transfer to a serving bowl. Tasty and healthy Vegetable rice is ready to serve.